Milwaukee developed a grid pattern of city streets already common in other eastern American cities. Some of these older cities provided access to the backs of buildings by running a narrower passageway, or alley, behind them to accommodate deliveries, stables, and waste storage. Sensibilities of the time called for hiding those less desirable functions from public view. Early plat maps and fire insurance atlases of the City of Milwaukee indicate that the central commercial district and most residential areas included alleys. While some towns in the Milwaukee area built alleys, the majority of its bedroom suburbs did not. Most blocks in Milwaukee are twice as long north to south as they are east to west. Milwaukee’s 15 to 20 foot wide alleys often bisected the full east/west width of the block. Another common pattern was a T-bone or H design, allowing rear access to businesses while keeping alley traffic from entering busy streets. 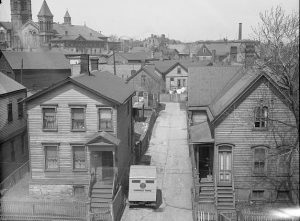 In the early days Milwaukee alleys were often maligned for being filthy, garbage-strewn, and breeding grounds for disease. 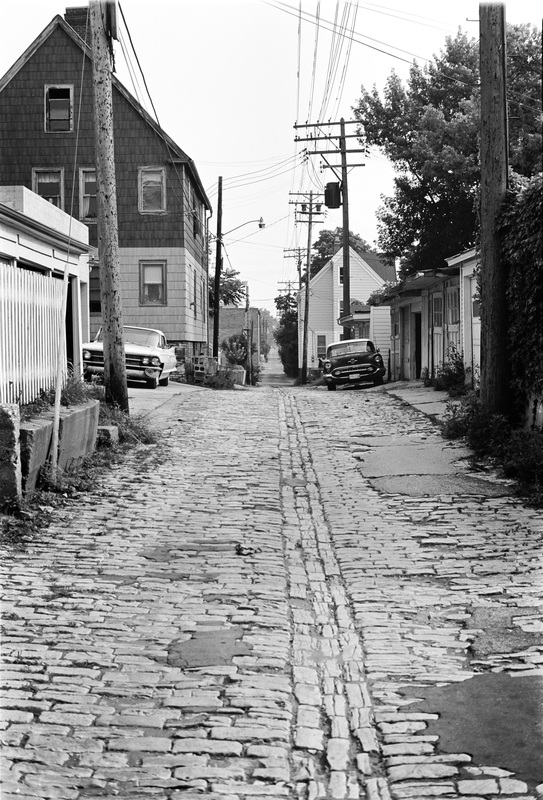 Alleys cleaned up their act as their surfaces evolved from dirt, to gravel, to brick or cobblestones, and finally, starting in the 1920s, to concrete. Asphalt was used to patch alleys. Today’s concrete alley is expected to last 50 to 60 years. Permeable surfaces that allow rainwater to soak into the ground are being experimented with. 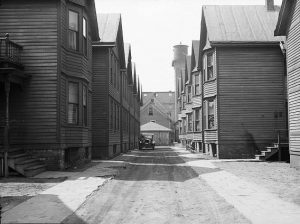 Because residential lots averaged 30 feet in width, it made sense to place horse stables, garbage and storage units, and, eventually, above-ground utility poles and automobile garages behind the houses, all accessible by alleys. Children also used alleys as informal playgrounds because the city had few parks before the 1890s. On many blocks east of 35th Street it is still not uncommon to see older homes built on alleys, usually behind a front house. Some alleys have three or four such units. While not the norm, this phenomenon was not exclusive to a particular side of town. Occasional businesses were also present in those alleys, such as bakeries and cooper’s shops. Sometimes those occupants petitioned that their alley be re-designated a street. West Elgin Lane is an example of an alley that “became” a street. Then there is the odd case of the alley that had a street name (Northwestern Lane) between Wisconsin Avenue, Michigan, Water, and Broadway, and later lost it. As early as 1900 some areas of the city were already being platted without alleys. By the 1930s federally subsidized garden cities, like Greendale, were built without alleys. Alleys were considered too expensive for government to build and maintain. By the early 1960s building residential side driveways instead of alleys had become the norm in new subdivisions of Milwaukee and its suburbs. However, there are still roughly 420 miles of alleys that the City of Milwaukee maintains and replaces as needed. ^ Laws of the Territory of Wisconsin (Madison, W.T. : Simeon Mills, Territorial Printer, 1846), 126. ^ For example, see: This Map of the City of New York and Island of Manhattan, as Laid out by the Commissioners Appointed by the Legislature, April 3d 1807 (New York: Bridges, William & Maverick, Peter, 1811). ^ For example, see: Topographical Map of the City of Cincinnati from Actual Survey Engraved and Published by Doolittle and Munson to Accompany “Cincinnati in 1841” (Cincinnati: Doolittle and Munson, 1841). ^Grady Clay, Being a Disquisition upon the Origins, Natural Disposition, and Occurrences in the American Scene of Alleys (Louisville: G. Clay & Co., 1978), 10. ^ George W. Cloos, Official Quarter-Sectional Atlas of the City of Milwaukee: According to the Records of the Register of Deeds at the Court House and at the Office of the City Engineer, City Hall (C.N. Caspar Company 1915), and Rascher’s Fire Insurance Atlas of the City of Milwaukee, Wis. (Western Fire Map Publishing Co., 1876). ^ Suburban Milwaukee officials (police, town clerks, city planners), telephone interviews with article author, April, 2015. The following municipalities have no alleys: Brown Deer, Franklin, Elm Grove, Germantown, Grafton, Greendale, Hales Corners, Mukwanago, Muskego, Pewaukee (City) River hills, Slinger. Those with few alleys—mostly in older areas—include Butler, Cedarburg, Delafield, Glendale, Greenfield, Hartford, Menomonee Falls, Oak Creek, Oconomowoc, Pewaukee (Village), Whitefish Bay. Those with a substantial number of alleys in older areas include Port Washington, St. Francis, Waukesha, Wauwatosa, West Allis. ^ Thomas Staats, retired, City of Milwaukee Engineering Dept., telephone interview with author, April, 2015. Good examples can be found in Insurance Maps of Milwaukee, Wisconsin, vol. 4 (Sanborn-Perris Map Co., 1894). ^ Daily Sentinel and Gazette (Milwaukee, Wisconsin), Tuesday, June 22, 1847. ^ Robert Viktora, Milwaukee Dept. of Public Works, Street Construction, telephone interview with author, April 27, 2015. ^ John Gurda, The Making of Milwaukee (Milwaukee: Milwaukee County Historical Society, 1999), 183, 204. ^ Carl Baehr, Milwaukee Streets: The Stories behind Their Names (Milwaukee: Cream City Pres, 1995), 78. ^ Yance Marti, Construction supervisor, Milwaukee Dept. of Public Works, email to author, July 24, 2015. ^ Insurance Maps of Milwaukee, Wisconsin (Sanborn Map Company 1910), 83-86, 97-98, and 103-10. ^ Clay, Being a Disquisition upon the Origins, Natural Disposition, and Occurrences in the American Scene of Alleys, 13. ^ City of Milwaukee Planning Guide for the Urban Highway and Street System (Milwaukee: Dept. of City Development, 1965? ), E-5. ^ “Some Alleys Take a Name and Move on up,” The Milwaukee Journal, February 1st, 1990. Clay, Grady. Being a Disquisition upon the Origins, Natural Disposition, and Occurrences in the American Scene of Alleys. Louisville: G. Clay & Co., 1978. Shastri, Devi. “City Constructing New Green Alleys.” Milwaukee Neighborhood News Service. Urban Milwaukee. July 24, 2015. If you need to contact the editors please use the Contact Form. A very interesting entry. Thanks.